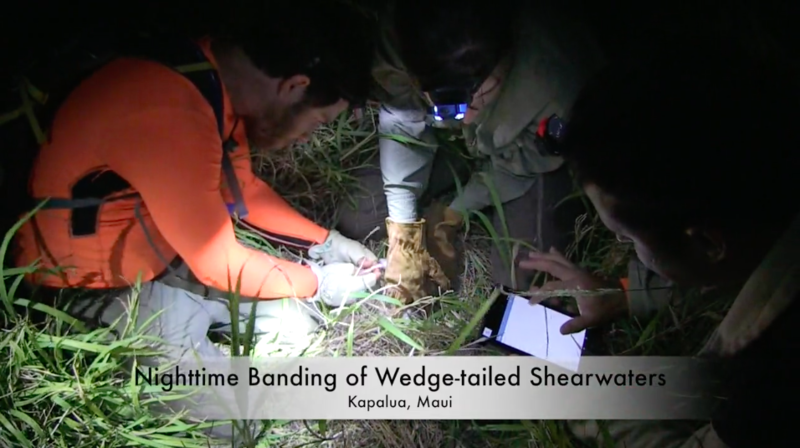 Kapalua, Maui– A group of volunteers, led by staff from the Maui Nui Seabird Recovery Project, banded 150 adult wedge-tailed shearwaters at a Kapalua colony in West Maui last night. Spring nighttime efforts to capture returning adults to look for banded birds recruiting into the breeding population began in 2008. Additionally unbanded adults are banded during the project. Wedge-tailedshearwaters tend to return to the same burrows each year and keep the same mate throughout their lifetimes. So each yearin mid-summer colonies are visited by researchers to determine active and non-active burrows. Penniman explained, “Pairsmay skip breeding during some years due to environmental factors, mate loss or habitat disturbance. Our monitoringmethods and banding will help shed more light on the frequency of breeding efforts.” The continuation and expansionof population studies is dependent on funding and staffing. Friday night,six teams comprised of grabbers, banders and recorders encountered nearly 250 birds. Approximately 100 already hadbands. After each bird is banded and checked for parasites or viruses, their heads are marked with a small dot of white-out. Penniman, Duvall, andvolunteers from Maui Land and Pineapple, DOFAW, and from area watershed partnership groups are passionate about this work. Pennimanexplains that the wedge-tailed shearwaters are among the first creatures to colonize the Hawaiian Islands. The birdsprovided much of the original organic material that built the islands and it’s possible they helped early Polynesian navigators find land. In modern times fishers often rely on sea-going shearwaters to help them spot abundant fishing grounds. Loss of habitat and human habitation have reduced seabird populations significantly. “They are a critical part of the circle of life,” Penniman said. In addition to the work at the Kapalua colony, this year during the breeding season, 50 burrows were marked at Kamaole Beach Park III to monitor for shearwater reproductive success. Duvallsaid, “We will now begin identifying banded birds in these burrows to further explore the breeding biology of the wedge-tailed shearwater and gather more data on site and mate fidelity.